“The L” in Chicago is well-known for being an above-ground transit system. That’s how it got its name — it’s elevated. 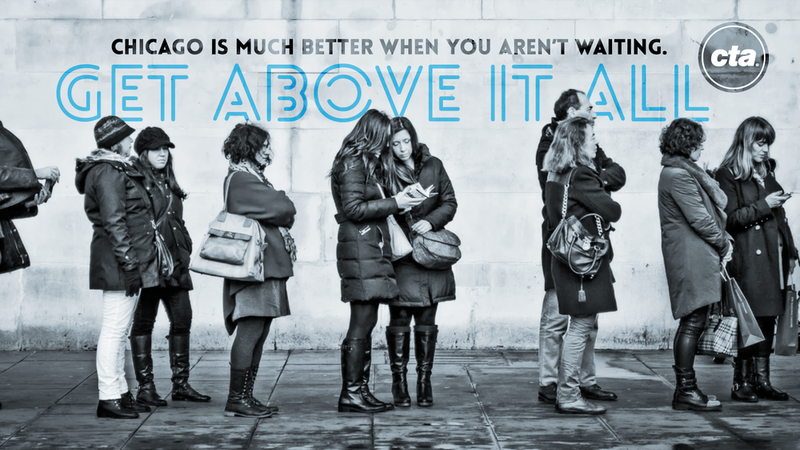 This campaign will highlight this fact, and encourage people to ride “The L” to Get Above It All. Graphics are shown on sides of buildings and as billboards. CTA will place murals on walls facing taxi stands and Uber pickups throughout city. Chicago is a unique city in that it has an advantage that many other places don’t have: skyscapers. CTA will utilize this height and place messaging on top of buses and crosswalks. Each station along the L will have murals with the names of the stop painted on the walls. When the train pulls in, the headline will be completed.